Christmas is always a good time for illustration. Shops are full of beautiful new picture books for children, and even adults get a look in as classics reappear illustrated with old favourites and new work by contemporary artists. It is also the time for family exhibitions. 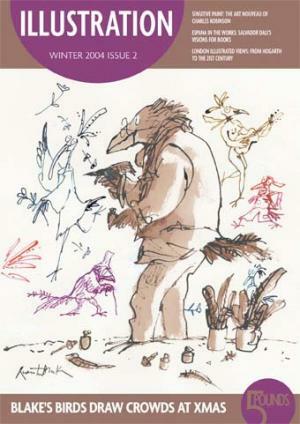 This year, those of us near London can enjoy an exhibition of the ever-popular Quentin Blake at Dulwich Art Gallery. Those who can't get there, however, can read our interview with Blake, in which he discusses his life, his work and his ambition to open a permanent illustration gallery and archive. If you’re still looking for presents to buy, you could go for a new book hand-crafted by the Incline Press (page 40), a surreal masterpiece by Salvador Dali (page 22) or you could track down a ghost of Christmas past and buy someone one of the original Victorian Christmas books of William Makepeace Thackeray (page 36). If you're tired after all this exertion or are just looking for something more decorative, why not learn more about the work of Charles Robinson or go armchair travelling through images of London through the ages? Further back still, we examine the incunabula of northern Europe, in a sequel to our article on early books of Italy in Illustration 1. Whether you decide to go out and party over the festive season or you prefer to curl up on the sofa under a blanket and wait for daylight to return, we hope you will enjoy issue 2 of Illustration as much as you enjoyed the first. The Illustration team wishes you a colourful Christmas and an illuminating new year.